5-1701 PROGRAM TRACKING AND REPORTING SUBSYSTEM (PTRS) ACTIVITY CODE. 1579. 5-1702 OBJECTIVE. The objective of this task is to verify that an applicant for chief pilot of a rotorcraft external‑load operation is qualified in aeronautical knowledge and practical experience to conduct an external-load operation safely and according to Title 14 of the Code of Federal Regulations (14 CFR) part 133. Successful completion of this task results in an indication of satisfactory or unsatisfactory. A. Authority. 14 CFR part 133, § 133.23 requires that a chief pilot designee demonstrate proficiency in knowledge and skill for rotorcraft external-load operations, and describes the maneuvers that must be demonstrated in a skill test for chief pilot. Section 133.21 outlines the ratings and qualifications that a pilot must hold in order to qualify as a chief pilot for external-load operations. B. Designation. Each part 133 certificate holder is required to designate the chief pilot for rotorcraft external-load operations. The chief pilot may be the applicant. The applicant may also designate a qualified pilot as an assistant chief pilot to perform the functions of the chief pilot when the chief pilot is not available. An assistant chief pilot must meet the same requirements as the chief pilot. 1) Section 133.23 requires that the chief pilot demonstrate proficiency in knowledge and skill for these operations. The inspector may base the determination that the candidate’s knowledge and skill are adequate based on the chief pilot’s previous experience and safety record in rotorcraft external-load operations. The chief pilot must have previously passed a knowledge and skill test for the same class of rotorcraft external-load operations. 2) The pilot must have passed a knowledge test for the same make and model of rotorcraft to be operated (see 14 CFR § 133.23(b)(3)). (Figure 5-191). This letter is sent to the Flight Standards District Office (FSDO). [Name of company] hereby designates Mr./Ms. [name of chief pilot], holder of pilot certificate number [enter certificate number], as chief pilot for rotorcraft external-load class [enter all appropriate classes] for this company. I hereby accept the duties and responsibilities of chief pilot for rotorcraft external-load class operations conducted by [name of company]. D. When to Administer the Knowledge and Skill Test. The inspector should administer the knowledge and skill test unless the applicant presents evidence that the chief pilot has previously passed the knowledge and skill test. The tests must have been for the same class of external-load and for the same make and model of rotorcraft. Only in rare circumstances would the applicant’s previous experience fully satisfy the requirements of § 133.23(d). E. Inspector Qualifications. The inspector conducting the skill test must be helicopter rated and have experience as an external-load pilot. The inspector may conduct the skill test in the helicopter with the applicant or observe from the ground. F. Experience, Testing, or Both Must Satisfy § 133.23. 1) To satisfy § 133.23(b)(1) and (2), the inspector may accept a logbook endorsement and/or a letter of competency to conduct rotorcraft external-load operations for the same class for which the operator is applying. 2) To satisfy § 133.23(b)(3), the inspector may accept a logbook endorsement for a knowledge test on the same type of rotorcraft, make and model. 3) To satisfy § 133.23(b)(4), the inspector may accept a logbook endorsement and/or letter of competency if the inspector has personal knowledge that the Rotorcraft-Load Combination Flight Manuals (RLCFM) of the previous operator and this operator are similar. 4) To satisfy § 133.23(c), the inspector may accept a logbook endorsement and/or letter of competency to conduct the same class of rotorcraft external-load operations if the pilot has no record of previous accidents, incidents, or violations in rotorcraft external-load operations. 5-1704 EXAMINATION OF THE CANDIDATE. Sections 133.21, 133.23, and 133.37 prescribe the pilot and testing requirements for rotorcraft external-load operators. Logbooks and any previous external-load competency letters must be made available to help determine whether a knowledge and skill test or portion thereof is required. A chief pilot’s knowledge and skill test will be conducted by a FAA inspector. The chief pilot or the inspector may conduct the knowledge and skill test for other rotorcraft external-load pilots in the same operation. Although the applicant may elect to be tested by an oral or a written test, the oral test should be encouraged because of the many differences between RLCFM and operations specifications (OpSpecs). 1) The pilot must be able to describe or answer questions about procedures for preflight of aircraft, attaching means, and personnel lifting devices, if appropriate. 2) The pilot should be able to conduct an accurate survey of the flight areas to be used. The pilot’s ability to evaluate and analyze correctly the pickup site, the route, and the landing site must be determined. The pilot should indicate that the routes for the approach to and departure from each site should be over the lowest obstacle and in the direction of the prevailing wind. 3) The pilot should be able to calculate weight and balance with emphasis on a lateral center of gravity (c.g.). The pilot must also correctly describe how to prepare the load, check the rigging, and attach that load to the helicopter. 4) The pilot should be able to identify the different types of webbing, nylon rope, chairs, clevises, and connector links. The pilot should have a general knowledge of the weight lifting capacity of each and the rigging of each. 5) For Class D authorizations, the pilot should know how to operate the personnel lifting device and be aware of its limitations. 6) The pilot must have thorough knowledge and understanding of the performance capability, operating procedures, and limitations of the helicopter to be used. The pilot should be able to calculate the adjusted gross weight performance when the temperature and/or density altitude changes. B. Communications Test. The pilot must demonstrate an understanding of the ground crew’s hand signals, as communication between the flightcrews and ground crews is critical in ensuring the safety of persons on the ground and in the helicopter. Class D authorization requires radio communication among flight and ground crewmembers, and, if appropriate, the pilot must show that he or she is familiar with standard radio phraseology and with phraseology developed for the operation. 1) The pilot must have complete knowledge of all material in the approved RLCFM. 2) When all the requirements are satisfied, the skill test is conducted. Because of the elaborate preparations and equipment sometimes involved in external-load operations, the inspector may conduct the skill test after failure of the knowledge portion if special circumstances make it necessary. The skill test may only be conducted at this time if the deficient knowledge area is unrelated to the skill test. C. Skill Test. The pilot must successfully perform flight operations for the appropriate load class in the helicopter for which certification is sought. For the purposes of the skill demonstration, the external-load weight, including the external-load attaching means, must be the maximum weight for which authorization is sought. The inspector can elect to conduct the skill test in the helicopter with the applicant or observe from the ground. a) Before liftoff, the pilot should make a check of security and proper rigging of the load. b) The rotorcraft and load must be lifted to an appropriate hover altitude where the pilot determines if power is available for takeoff. c) While at a hover, the pilot must demonstrate that adequate directional control is available by making heading changes of 180° to each side of the proposed takeoff path. d) The pilot must demonstrate smooth acceleration from a hover into forward, climbing flight. Sufficient power, not to exceed the maximum allowable, must be applied on takeoff to ensure that the aircraft clears the tallest immediate obstacle safely. e) The pilot must demonstrate horizontal flight at the maximum operational airspeed for the load authorization requested. f) The pilot must demonstrate normal and steep approaches. h) During preflight, the pilot must demonstrate that both electrical and manual functions of the rotorcraft attachment system operate properly. i) Before liftoff, the pilot should make a check of security and proper rigging of the load. j) The pilot must demonstrate pickup of the external-load. The load should be lifted slowly in a vertical ascent until the sling becomes taut and centered. The load is then lifted to an appropriate hover altitude where the pilot determines if power is available for takeoff. k) While at a hover, the pilot must demonstrate that adequate directional control is available by making heading changes of 180° to each side of the proposed takeoff path. l) The pilot must demonstrate smooth acceleration from a hover into forward, climbing flight. Sufficient power, not to exceed the maximum allowable, must be applied on takeoff to ensure that the load clears the tallest, immediate obstacle safely. m) The pilot must demonstrate horizontal flight at the airspeed for which authorization is requested. As the airspeed is increased, low-density light loads generally tend to shift further aft and may become unstable. When the load is of greater density, more compact, and better balanced, the ride is steadier and the airspeed may be safely increased. Any unstable load may flutter, oscillate, or rotate, resulting in reduced aircraft control and undue stress on the helicopter. A reduction in forward airspeed will usually allow regaining of aircraft control and steadying of the load. If the load begins oscillating fore and aft or fluttering, it is especially important that the helicopter’s forward airspeed be reduced. n) The pilot must maneuver the external-load into the release position and release it, under normal flight conditions, using the normal and, if practicable, emergency release controls. o) The pilot must demonstrate winch operation if a winch is used to lift the external-loads. The pilot and the winch operator, if appropriate, should each operate the winch during the test. Whenever the cyclic grip switch location or function has been modified, the pilot must demonstrate the ability to actuate the switch in normal operations and simulated emergencies without having to assume an unusual finger or thumb position that may induce unwanted control input. 3) The pilot must make a preflight check of the electrical and mechanical functions of the rotorcraft’s attachment system. a) The pilot must lift a portion of the load if it is to be dragged, or lift the entire load if it is ballast for a wire stringing operation. b) The pilot must demonstrate lateral (sideward) flight with proper speed, heading control, and smoothness. c) If the operator plans on towing (boats, barges), the pilot must demonstrate forward flight. d) If a winch is installed, the pilot or winch operator must demonstrate its use. 4) For Class D load authorization flight checks, the pilot must demonstrate the same maneuvers as indicated for Class B, including winch operations, if applicable. The test should include picking up a dummy load, moving this load to a predetermined area, and releasing the load under normal circumstances. 1) Upon successful completion or documentation of the knowledge and skill test, the inspector may endorse the pilot’s logbook and may also issue a letter of competency. For convenience, the pilot may carry a certificate of competency instead of a logbook. 2) If the applicant fails a portion of the test, the inspector may use discretion in the handling of the remainder of the exam. The inspector may terminate the test at the point of failure, debrief the pilot on the failed portion, notify the operator of the test results, and schedule a retest within 30 days. The designee would be retested for the portion failed and any parts not completed, if applicable. If the test is retaken after 60 days, the entire skill test must be repeated. 5-1705 CHIEF PILOT RESPONSIBILITIES. The chief pilot’s duties include training the other rotorcraft external-load pilots in the operation, maintaining the training and experience records of the other pilots, and conducting the knowledge and skill tests of the other pilots. A. Delegation of Responsibilities. The operator may designate an assistant chief pilot to conduct the chief pilot’s duties in the chief pilot’s absence. The assistant chief pilot must meet the same requirements as the chief pilot. B. Change of Chief Pilot. The holder of a rotorcraft external-load operator certificate must report any change in designation of chief pilot or assistant chief pilot to the certificate-holding district office (CHDO) as soon as the change occurs. The new chief pilot must be designated and comply with § 133.23 within 30 days of the departure of the previous chief pilot. If 30 days expire before the required notification or compliance occurs, the certificate holder must cease operations unless specially authorized by the CHDO. 5-1706 SPECIAL KNOWLEDGE TEST CONSIDERATION. Investigation of helicopter accidents revealed a cyclic grip design feature that may compromise a pilot’s ability to jettison an external-load rapidly in an emergency. In one accident during a class b operation, the helicopter, while hovering out of ground effect, attempted to lift a load from a ridgeline in a sling. The pilot unknowingly exceeded the helicopter’s capabilities during the pickup, and the helicopter began to descend. The load rolled off the ridge, dragging the helicopter with it. The pilot was unable to jettison the load quickly because the electric release button was located in an awkward position on the top right side of the cyclic. As a result, the helicopter received substantial damage. The operator of the helicopter had modified the cyclic grips of most of the other helicopters in the fleet by moving the electric release switch to a more accessible location on top of the cyclic grip; however, this helicopter had not yet been modified. Thus, the pilot was flying a familiar type of helicopter but one that had a different cargo quick-release switch location. The pilot instinctively relied on past experience and training when reacting to the emergency yet became confused as to the exact location of the quick release switch on the unmodified helicopter. The problem is not unique to rotorcraft used in external-load operations; cyclic grip switch locations and functions differ on many helicopters and can be changed at the option of the operator. Rotorcraft external‑load operators should be informed of the confusion associated with the modification of cyclic grip switch locations or functions. Whenever the quick-release location or function on the pilot’s primary control (usually the cyclic grip) is modified, operations inspectors shall request external-load operators to have pilots demonstrate their ability to activate the switch in normal operations and simulated emergencies without having to assume an unusual finger or thumb position which may induce unwanted control input. 5-1707 PREREQUISITES AND COORDINATION REQUIREMENTS. A. Prerequisites. This task requires knowledge of part 133 regulatory requirements and FAA policies and qualification as an aviation safety inspector (ASI) Operations. In addition, the inspector should be helicopter rated and have rotorcraft external-load experience. B. Coordination. This task may require coordination with the airworthiness unit. 5-1708 REFERENCES, FORMS, AND JOB AIDS. · Title 14 CFR Parts 1, 27, 29, 61, 91, and 133. · Advisory Circular (AC) 133-1, Rotorcraft External-Load Operations in Accordance with Federal Aviation Regulations Part 133. · Approved Rotorcraft Flight Manual (RFM). · FAA Form 8400-8, Operations Specifications, if applicable. · FAA-S-8081-16, Commercial Pilot Practical Test Standards - Rotorcraft. · PTRS Procedures Manual (PPM). B. 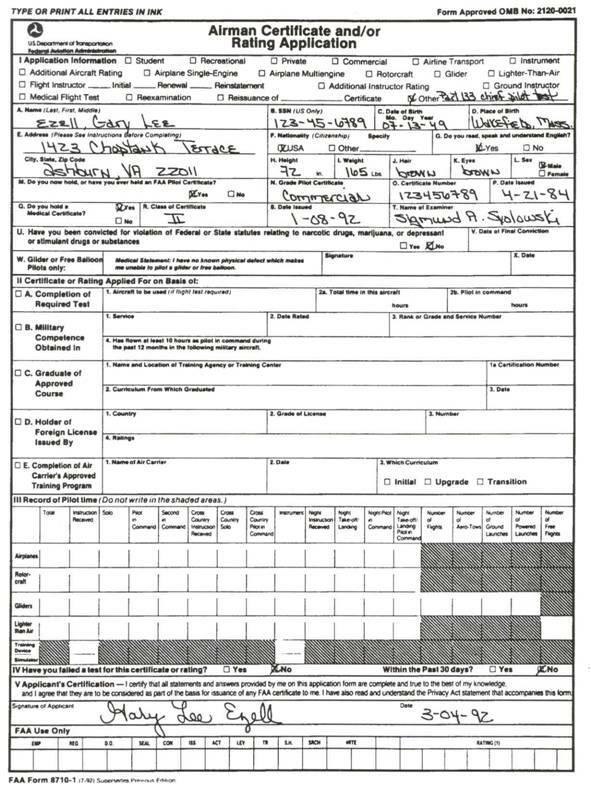 Forms: FAA Form 8710-1, Airman Certificate and/or Rating Application (Figure 5-192). C. Job Aids. Sample letters and figures. 1) In Section I, the block labeled “Other” should be checked and “14 CFR Part 133 Test” entered in the blank. 2) Section I, blocks A through V, must be filled out. 3) Section II, blocks A, 1, 2a, and 2b must be completed. 4) Section III should report the applicant’s rotorcraft time only. 5) Section IV and V must be completed by the applicant. 6) No instructor endorsement is required. B. PTRS. Open PTRS file. C. Review Application. Check the application to ensure that it has been completed properly. D. Verify Applicant’s Identity. Inspect acceptable forms of identification to establish the applicant’s identity. Compare the identification with the personal information provided on FAA Form 8710-1 (see Volume 7, Chapter 6, Section 1 of this order). 1) If the applicant’s identity can be verified, proceed with the task. 2) If the applicant’s identity cannot be verified because of inadequate identification or lack of identification, explain what types of identification are acceptable. Advise the applicant to return with appropriate identification to reapply. 3) If the applicant’s identity appears to be different from the information supplied on FAA Form 8710-1, or it appears that an attempt at falsification has been made, do not continue this task (see Volume 7, Chapter 6). E. Determine Whether Applicant Must Take a Knowledge and Skill Test. Consult the following sources in determining an acceptable level of experience as an alternative to taking all or parts of the knowledge and skill test. 1) Examine the applicant’s logbook for experience in rotorcraft external-load operations in the same type rotorcraft conducting the same class of operation. 2) Review a previous letter of competency to verify the applicant’s qualifications for the same class of operation, using the same type of rotorcraft. 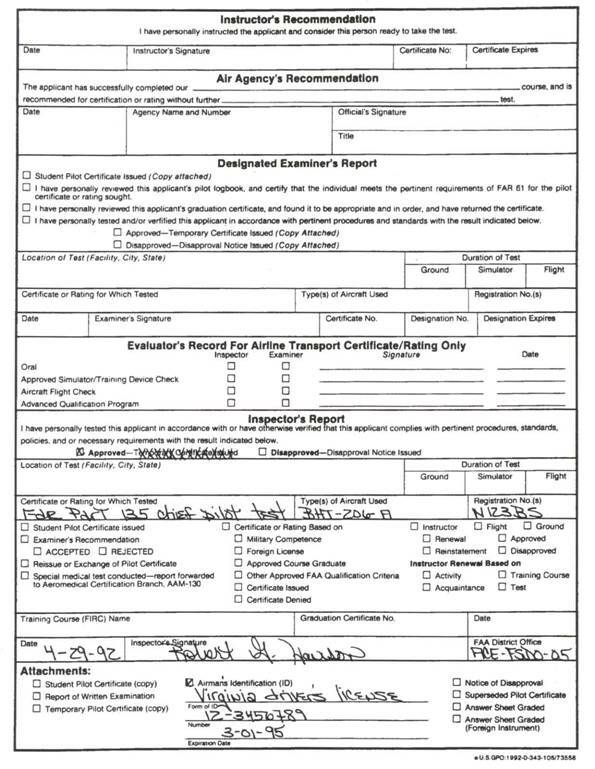 3) Examine the applicant’s military record of external-load experience, if applicable, to determine if it reflects experience in the same type aircraft conducting the same class of operation sought. F. Enforcement Information System (EIS)/Accident Incident Data System (AIDS) Data. Using office procedures, determine the applicant’s accident, incident, and violation history. · Endorse the applicant’s logbook (Figure 5-194). 2) If the EIS/AIDS data is negative and a knowledge and skill test is required, conduct the test. 3) If the EIS/AIDS data shows an unexpired enforcement action related to external-load operations, inform the applicant that the test cannot be conducted until the terms of the action are met. Notify the operator in writing (Figure 5-195). On [date], [name of pilot], holder of [certificate grade and number], satisfactorily demonstrated the knowledge and skill requirements of 14 CFR § 133.37(a)(1). This letter informs you that [name of chief pilot nominee] is ineligible for designation as a chief pilot for 14 CFR part 133 operations. During a review of [name of chief pilot nominee]’s enforcement history, it was determined that [type of enforcement action and justification for ineligibility]. Please submit a new chief pilot nominee within 30 days from receipt of this letter. If you have any questions concerning this matter, please contact this office at [FSDO’s telephone number]. G. Knowledge and Skill Test. 1) Determine the applicant’s ability to survey the flight area for obstructions, approach and departure paths, and know the requirements for preparation of a Congested Area Plan (CAP). Present the applicant with a scenario which may include a diagram of a hypothetical flight area, and ask the applicant to answer questions about how to survey that area and to describe the pertinent issues. Present varying meteorological conditions, and have the applicant explain how to conduct the operation under those conditions. 2) Determine whether the applicant knows the proper method of loading, rigging, and attaching an external-load. a) Loading. Ask the applicant to determine weight and balance. Test the applicant’s ability to compute weight and c.g. for the particular class. Provide at least two problems. Both problems should test the applicant’s ability to compute lateral and longitudinal c.g.. The applicant should be able to determine the actual c.g. of the aircraft. One problem should reflect a situation within the limits of the rotorcraft, and one problem in which the c.g. is outside the limits of the rotorcraft, requiring a shift of weight. · The load is rigged so that if the rigging should happen to fail, the rigging or the load will not become entangled with the rotor systems. c) Attaching. Ask the applicant to explain how to attach external-load attaching devices that may be installed and/or removed by the pilot. The applicant must explain how to preflight the attachment system and explain how to test the normal and emergency release systems. 3) Determine the applicant’s knowledge of performance capabilities and limitations. a) The applicant must be able to determine if tail rotor effectiveness is adequate when charts are provided by the manufacturer. b) For Classes B, C, and D, the applicant should be able to determine the maximum load that will permit hovering out of ground effect for the conditions specified by the inspector. c) Refer to the limitations sections of the approved RFM and the RLCFM to formulate questions regarding limitations. The applicant shall answer the questions from memory. 4) Determine if the applicant knows the proper methods of instructing ground and flight crewmembers. Create scenarios and role play the positions of a flight crewmember and a ground worker. The applicant should be able to instruct the inspector as if the inspector was an actual flight crewmember or ground worker. 5) Determine the applicant’s knowledge of the manufacturer’s RFM. Determine knowledge of limitations and ability to compute actual performance problems for conditions specified by the inspector. 6) Determine the applicant’s knowledge of the RLCFM. Refer to the RLCFM and ask the applicant to demonstrate hand signals and answer questions on other topics that the pilot would have been expected to commit to memory. a) Classes A, B, C, and D, Weight and Balance: Determine if the applicant can calculate the weight and c.g. for the appropriate class. The inspector should provide at least two problems, both of which test the applicant’s ability to compute lateral and longitudinal c.g., if appropriate. One problem should be within the limits of both the manufacturer’s RFM and the RLCFM. For a problem involving a c.g. location that exceeds the limit, the applicant should be able to compute redistribution of the load in order to bring c.g. within the normal limits. b) Class C: Test the applicant’s knowledge of the negative stability characteristics that occur when the load is in continuous contact with land or water. The candidate should be able to explain the conditions that would aggravate controllability and to explain how to compensate for the negative stability characteristics. c) Class D: Refer to the appropriate OpSpecs and formulate questions on their content, specifically, authorizations, conditions, and limitations. The applicant should have a working knowledge of the content of the OpSpecs. H. Results of the Knowledge Test. 1) If the knowledge test is satisfactory, conduct the skill test. 2) If the knowledge test was not satisfactorily completed, inform the applicant and determine whether to conduct the skill test. Notify the company in writing of any deficiencies. a) Reschedule the knowledge test. b) Indicate “Disapproval” on the reverse of FAA Form 8710-1. Sign and date the application and then place it in the FSDO file. Do not forward to the Airmen Certification Branch (AVN-760). 1) The rotorcraft should be loaded to near maximum weight for the conditions. 2) For Class D authorization, conduct the test substituting ballast for human load. 1) If the knowledge and skill test is satisfactorily completed, make an appropriate endorsement to the pilot’s logbook (Figure 5-194) and issue a letter of competency (Figure 5-195) to the pilot. Specify the class in which the pilot has demonstrated competency. a) Indicate “Approved” on the reverse of FAA Form 8710-1.
b) Sign and date the application, then place it in the FSDO file. Do not forward to AVN-460. 2) If the knowledge and skill test is not satisfactorily completed, do not endorse the pilot’s logbook to that effect. a) Indicate “Disapproved” on the reverse of FAA Form 8710-1. K. PTRS. Make final PTRS work entry. 5-1710 TASK OUTCOMES. Completion of this task results in one or more of the following. · Issuance of a letter of competency. · Endorsement in the pilot’s logbook confirming designation as chief pilot, rotorcraft external-load operations, and the class for that operation. · Written notification to the operator of the test results and a record of that notification. · Retest a pilot who was unsatisfactory. · Test the applicant again for an additional class authorization. · Test a new chief pilot for the operator. RESERVED. Paragraphs 5-1712 through 5-1730.